Dr. Ellen Stofan is a planetary scientist, STEM advocate and Chief Scientist at NASA. Her research interests include the geology of Venus, Mars, Titan and Earth and she’s been involved in several planetary missions including Cassini (Radar Team), the proposed Titan Mare Explorer mission, and the Magellan mission to Venus. How did you become interested in a career in planetary science? I have an unusual story in that I grew up at NASA. My father worked at Glenn (then Lewis) Research Center in Cleveland working on the launch vehicle that sent the Viking and Voyager spacecraft into space. So space and NASA were always part of my life. My mother (a science teacher) took a geology class when I was about 11, and I thought wow- here is a career where you get paid to pick up rocks! Then during the Viking launches, I heard talks by the mission scientists, and realized you could combine geology and NASA- and I was sold. There’s a variety of worlds that your research covers including Venus, Mars, Earth and Titan. What fascinates you most about these worlds? In all of what I do, I am thinking about how can studying this place can help us to better understand Earth. It is really about comparative planetology. How can I study volcanoes around the solar system to better understand how a volcano works? Venus to me is so fascinating because it really is the Earth gone wrong. A runaway greenhouse planet with a surface covered by volcanoes, but you started out with a place that really wasn’t all that different from Earth. Mars is the place to go to really answer the question of whether or not life evolved off Earth. Titan is just cool- the only other place in the solar system where it rains—where rivers flow down to seas. Sapas Mons is displayed in the center of this computer-generated 3-D perspective view of the surface of Venus. Lava flows extend for hundreds of kilometers across the fractured plains shown in the foreground to the base of Sapas Mons. Credit: NASA / JPL. You proposed a Discovery-class mission called Titan Mare Explorer that would explore one of the hydrocarbon seas on Titan. A floating lander on an extraterrestrial sea sounds incredible. Although it wasn’t selected, do you think a similar mission may be considered? We will one day sail on Titan’s seas! They are just too interesting and clearly a place to go to understand the limits of life in our solar system. You have a liquid, but not water, and extremely cold temperatures. Does this preclude life? Beyond the life question, they are the only other place to go in the solar system to study lacustrine/oceanographic processes like wave generation, air-sea interface processes, shoreline modification. So amazing! Earlier in 2015 you made an announcement that we should have definitive evidence of life outside of Earth within 20 to 30 years. How will we obtain the definitive evidence? Should we expect future missions to have more instrumentation designed specifically for detecting life? Artist’s rendering of the Titan Mare Explorer Probe (TiME) in deployed configuration as it would be floating on Ligeia Mare. Credit: the Titan Saturn System Mission (TSSM) NASA/ESA joint summary report. I think that rovers like Curiosity and 2020 are going to get us part of the way there. Curiosity has already found tantalizing evidence of organics and traces of methane. And it is my driver for why I want to see humans at Mars in the 2030s- microbial evidence of life is going to be hard to find, and as a geologist who spends part of my time in the field, I have a bias it is going to take astrobiologists and geologists on the surface looking at a lot of rocks to convince the community we have found definitive evidence of life. Then there is our planned mission to Europa- another prime target where life may have evolved beyond Earth. And as we move out to beyond the 30 year mark, we will be increasingly analyzing planets in habitable zones around other stars, characterizing their atmospheres, assessing their potential habitability. So to me we are on the edge of this new era where we are so close to answering the question- are we alone? Any bets with colleagues on this timeline? No – some people think I am overly optimistic and some think I am overly conservative! Can you explain the role of the Chief Scientist at NASA? What does a typical day or week look like for you? My days are wonderfully varied. I might go work on a cross agency group assessing research in the Arctic, come back and have a meeting on diversity and inclusion at NASA, a meeting on how to get underrepresented groups more involved in STEM, on the latest work on research on the International Space Station to keep humans healthy on the long trip to Mars, then go get an update on exciting upcoming science missions like WFIRST or Europa. So never dull, but sometimes I do have to go to budget meetings! With a background in field geology, do you still sometimes get the opportunity to crack open some rocks with a hammer? I have been too busy to get out in the field, which makes me sad and stressed! I absolutely love getting out and studying volcanoes. My favorite is Mt. Etna – a really interesting and complex volcano. I also love the Icelandic volcanoes. So I am going to try to sneak off this fall and do some fieldwork! This self-portrait of NASA’s Curiosity Mars rover shows the vehicle at ‘Namib Dune,’ where the rover’s activities included scuffing into the dune with a wheel and scooping samples of sand for laboratory analysis. At the 2014 Fall Meeting, you gave the Shoemaker Lecture with a focus on comparative climatology. Do you find the general public is more receptive to exploring other worlds when they see how it contributes to understanding and protecting our own planet? I wanted to focus on comparative climatology because climate change is the key challenge that we face. When you look at the recently released temperature numbers and see the warming that is going on, especially in the Arctic, it is really alarming. As a geologist I am not accustomed to rapid change and that is what we are immersed in due to human induced climate change. I think that bringing in the fact that we study climates on other planets, where we look at how greenhouse gases affect those planetary climates, perhaps can help the public understand that we understand the role of greenhouse gases a lot better than they think we might. Also, studying specific issues, like the role of clouds and aerosols on other planets, can help us understand the complexities that go into climate modeling. Do you have any recommendations and advice for those considering careers in planetary science? Of course the simplest advice is to find something that really excites you. Graduate school is long and hard and you have to absolutely love what you are doing to get through it. But given that we are going from the situation that I had in the beginning of my career, when we had nine planets (sorry Pluto!) to the situation now – thanks in large part to Kepler – where we have thousands of planets to study, the field is going to be growing by leaps and bounds and becoming more and more interesting and complex! 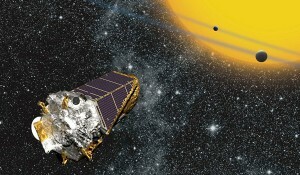 Artist’s conception of the Kepler space telescope observing planets transiting a distant star. Credit: NASA Ames / W Stenzel. What type of data would you be most interested in collecting from another world? I go back to this fundamental question of – is there life beyond Earth? We have the perfect places in this solar system, and the technology and ability, to go answer this question at Mars-Europa-Enceladus-Titan. In most of these places, we need to get down onto the surface or in the case of plumes at Enceladus and Europa we may be able to grab samples while flying by! Here is a collection of further reading resources compiled by Dr. Stofan for those interested in learning more on some of the topics briefly covered in this interview. Stofan, E.R., Smrekar, S.E., Nils Mueller, N., Joern Helbert, J., Themis Regio, Venus: Evidence for recent (?) volcanism from VIRTIS data, in press, Icarus doi:10.1016/j.icarus.2016.01.034, 2016. Stofan, E.R. and A.W. Brian, Geologic Map of Themis Regio, Venus Quadrangle (V-53), U.S. Geological Survey, Scientific Investigations Map 3165, 2012. Anderson, S.W., Smrekar, S.E. and E.R. Stofan, Tumulus development on lava flows: insights from observations of active tumuli and analysis of formation models, Bull. Volc., DOI: 10.1007/s00445-012-0576-2, 2012. Jones, T.D. and E.R. Stofan, Planetology: Unlocking the Secrets of the Solar System, National Geographic, 2008, 224 pp. Stofan, E.R. et al., The Lakes of Titan, Nature, 445, 61-64, doi:10.1038/nature05438, 2007. Stofan, E.R., S.W. Anderson, D.A. Crown, J.J. Plaut, Emplacement and composition of steep-sided domes on Venus, J. Geophys. Res., 105, 26,757-26,772, 2000. Guest, J.E. and E.R. Stofan, A New View of the Stratigraphic History of Venus, Icarus, 139, 55-66, 1999. Smrekar, S.E. and E.R. Stofan, Coupled upwelling and delamination: A new mechanism for coronae formation and heat loss on Venus, Science, 277, 1289-1294, 1997. — Mark Hilverda is a geoscientist and Web Manager for the Planetary Sciences Section. He enjoys being where science, design, and technology collide. Feedback and suggestions for future articles and interviews are always welcome.